Based in the regional country town of Young, trusted family-run business South West Stone wanted their customers to no longer feel bound to the farm in order to track the levels and condition of their livestock troughs. The story of how NewieVentures were engaged to develop a smart but simple trough monitor device first started with a customer-base voicing their problems and a client not only listening, but willing to do something new and innovative within their business to solve it. Although South West Stone already held a great reputation for manufacturing dependable concrete water troughs, the issues faced by their dedicated customers drove them to take the initiative to create an even better product. Although the technology and expertise required to accomplish a solution was outside the scope of their 22-year old business model, South West Stone were driven to initiate the research and development needed to approach the project ahead. Where the story of this project faced some hurdles was during South West Stone’s initial attempts at sourcing assistance in developing the efficient yet simple product they had in their sights. As many within the business of electrical engineering are aware, creating something complicated is easy, creating something simple on the other hand poses many complications. Across a number of consultations, South West Stone were led to believe the product they requested was infeasible and required unnecessarily complex technology and design. This misinformation meant our client’s initial aspirations for the efficient solution to their problem were curtailed and their confidence in finding a subsequent result was increasingly diminishing. When South West Stone eventually approached NewieVentures in late 2017, they learnt that despite what others might have led them to believe, the project could go ahead in the direction they originally had in their sights. We at NewieVentures saw significant merit in what the client proposed and valued their intentions to innovate within their business to produce more meaningful results for their customers through their current products. Leveraged by previous projects that utilised similar LoRa enabled technology to produce live, trackable sensor data, the product design phase was executed quickly and efficiently. Within 3 months, the South West Stone Trough Monitor was ready to be trialed within country Australia. Fast forward to today and the South West Stone Trough Monitor is undergoing a final field trial period for further feedback and product refinement. 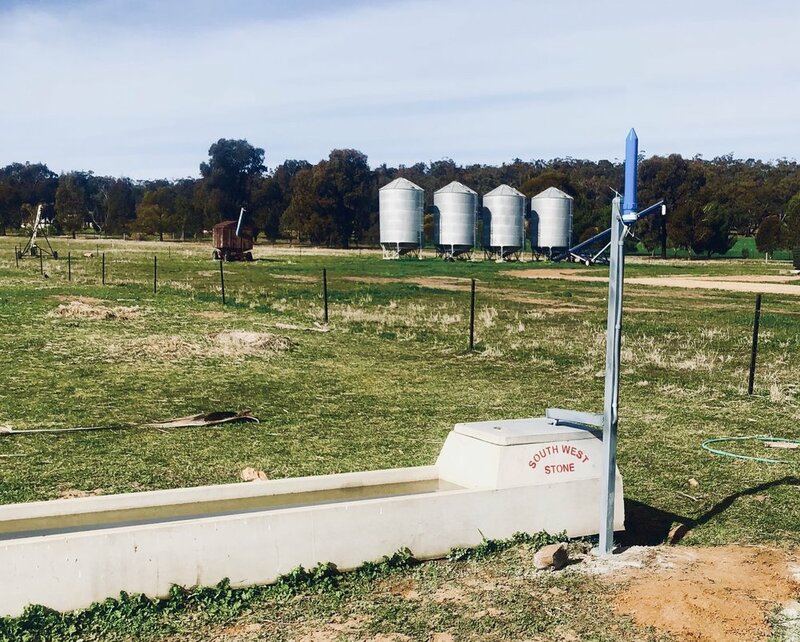 Although the device is yet to enter the commercial market, our client has been over-joyed by the efficiency they have observed on the farm and are enthuastic about the future of the device as part of their signature troughs. Through our dedication to the client’s project and their intentions to grow the product within the market, NewieVentures have continued to review the device’s results within the field and adapt the technology and design of the Trough Monitor accordingly. Newie Ventures are proud to have taken on a project alongside a client that saw real value within innovation. South West Stone have not only proven that Australian business can improve their profitability through innovative development, but that an inherently valuable customer experience can also be realised through industry disruption and smart design.